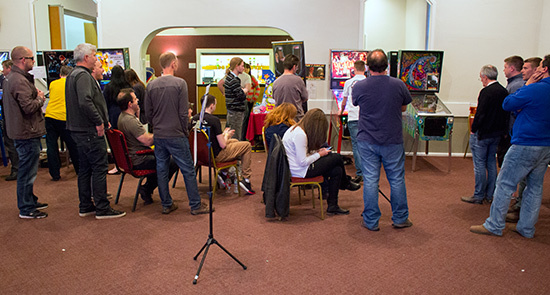 After taking a break in 2013, the South Coast Slam returned to The Charmandean in Worthing for 2014, with renewed vigour and a mix of movie themes. 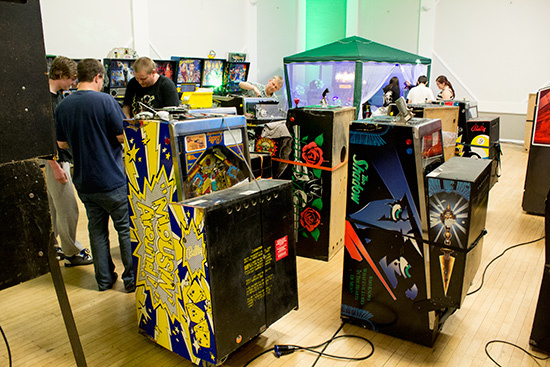 The show opened to the public on Saturday morning, but set up began on Thursday when a good number of the weekend's video games and the first pinball machines were transported to the venue. 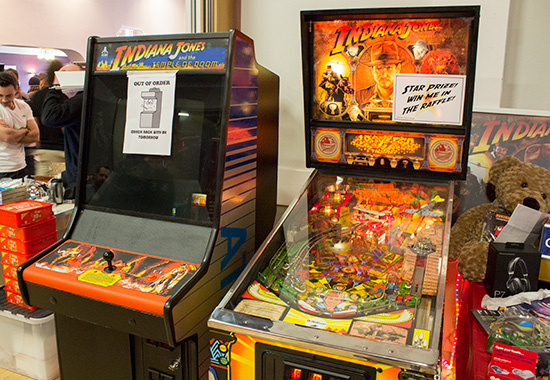 The main theme for 2014 was Indiana Jones, and in keeping with this, the top prize in the charity raffle was a newly refurbished and re-decaled Indiana Jones pinball, with the second prize of an Indiana Jones video game in similar condition. Both arrived early. 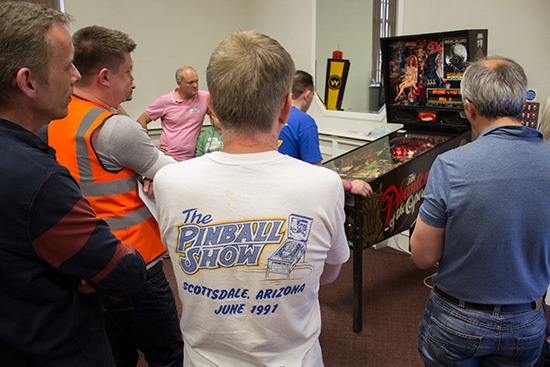 Set up continued throughout Friday daytime, as a constant stream of cars, vans and trucks turned up to swell the number of pinballs and videos available to play in the hall.. 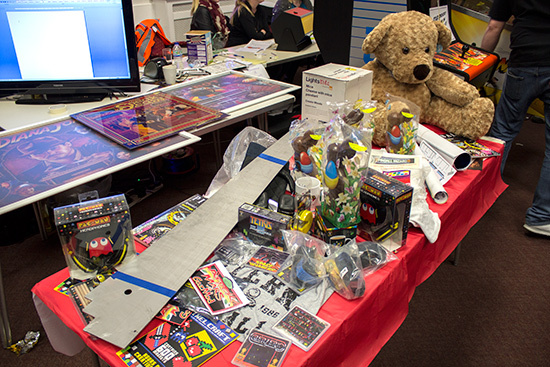 The main raffle prizes reflected the mix of games at the South Coast Slam - mostly pinball, but with a good representation of video games making up around 40% of the titles available to play. 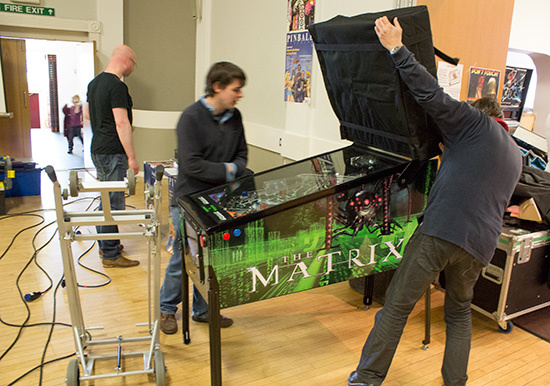 But it wasn't only machines arriving in the hall. 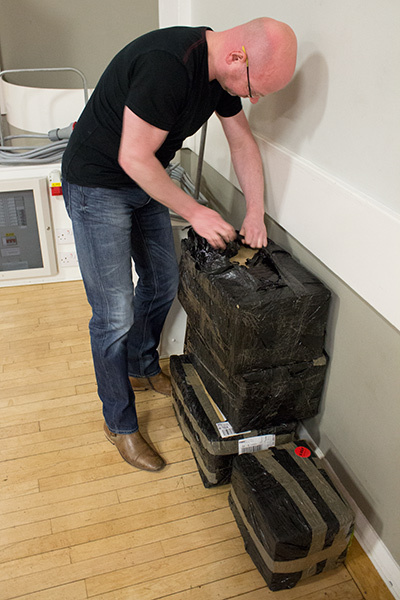 Earlier in the day, a delivery of mysterious black plastic-wrapped boxes had also arrived. 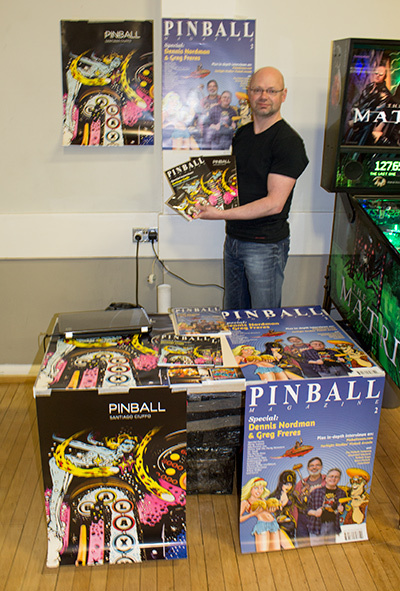 These contained the first copies of the book Pinball, photographed by Santiago Ciuffo and published by Jonathan Joosten of Pinball Magazine. Jonathan hadn't seen the finished product before, and was at the Slam to unwrap the first copies. We'll see how they turned out a little later. Just after 6pm, most of those still setting up the show departed for a group Chinese dinner in Worthing town. But with much work still to be completed, most returned soon after 8pm to continue preparations until the hall closed at midnight. The first public day of the show was Saturday, and expectations were high. There had been plenty of promotion on local TV. 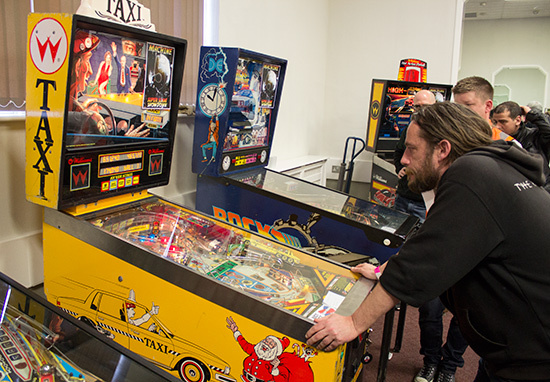 Both the BBC and ITV had run stories about Slam organiser Will Barber, his wife Jess, and their video/pinball home life. Links to these and more are on the South Coast Slam page on Facebook. 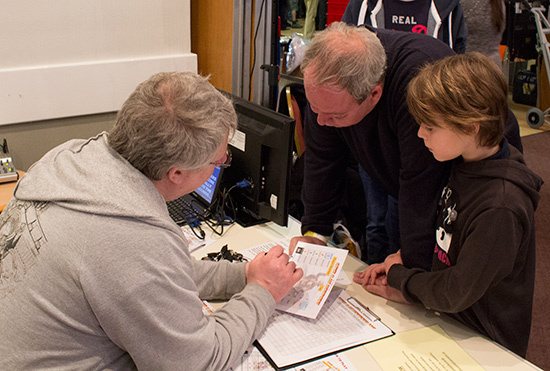 Entry to the South Coast Slam cost £12 ($20/€14.50) per day for adults, £20 ($33.50/€24.30) for a weekend pass, and free for kids 13 and under. To join in the charity raffle cost £5 per strip of 5 tickets. 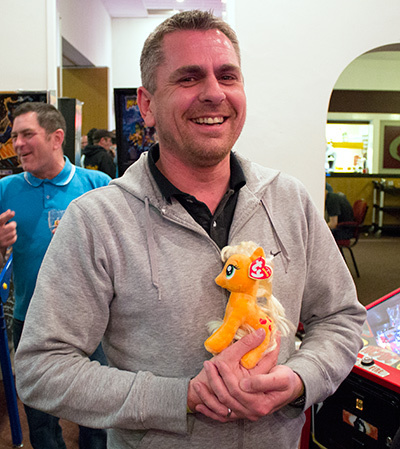 In addition to the two Indiana Jones machines, there were plenty of other attractive prizes to be won. 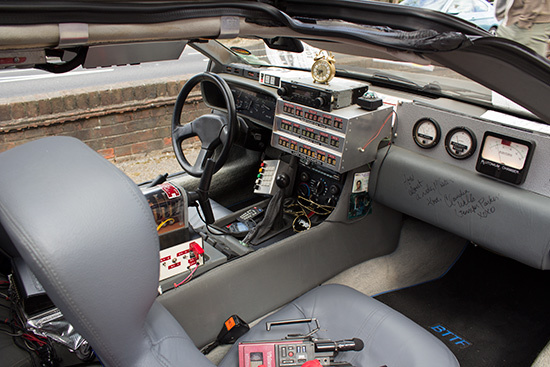 As 10am approached, the last finishing touches were made to the machines and all tools stowed in preparation for the arrival of the public. 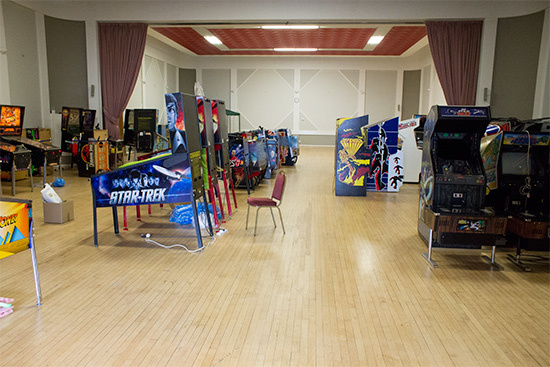 The doors opened and it wasn't long before all the machines in the main hall and those in the tournament area were in near-constant use. 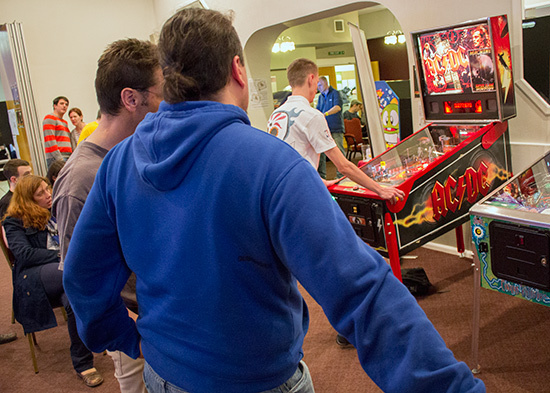 Two rows of pinballs greeted visitors as they entered the hall, with the newest Stern machines directly facing the entrance. 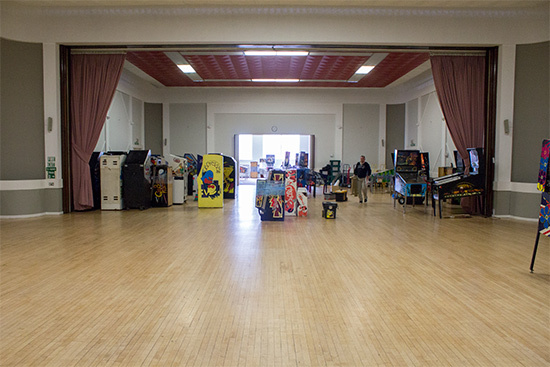 Backing on to the right-hand row of pinballs above were the first two rows of video games. 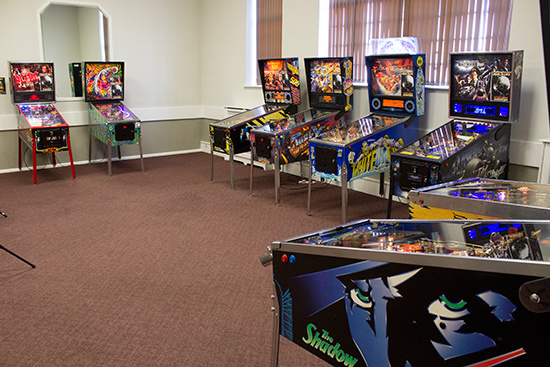 Then on the right of those was one more row of videos, with another of pinballs against the right side wall. 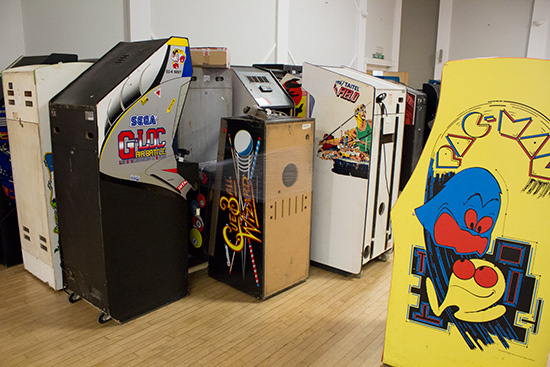 And stretching across the back of the hall was... another row of pinballs. 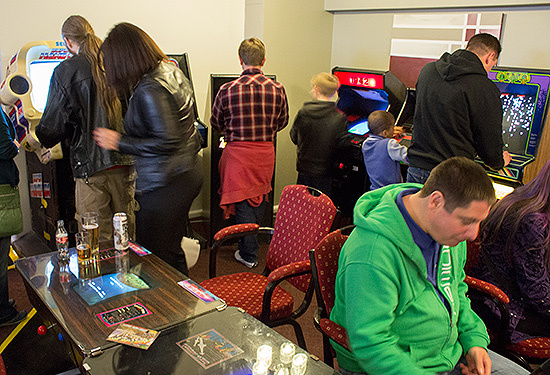 There were more video games set up in the bar area, including a number of table-top models which allowed gamers to relax with a drink or snack while still carrying on playing. 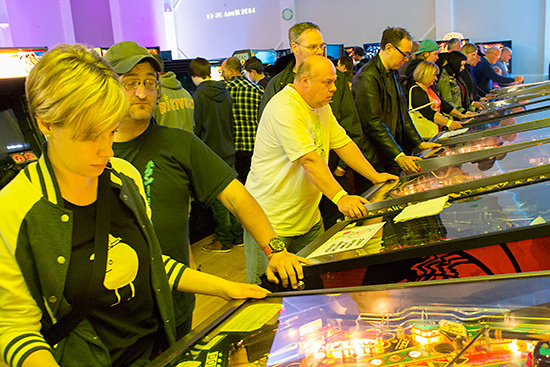 There was a slight shift in balance towards video games at this year's show, so the number of pinballs was slightly lower than in 2012. 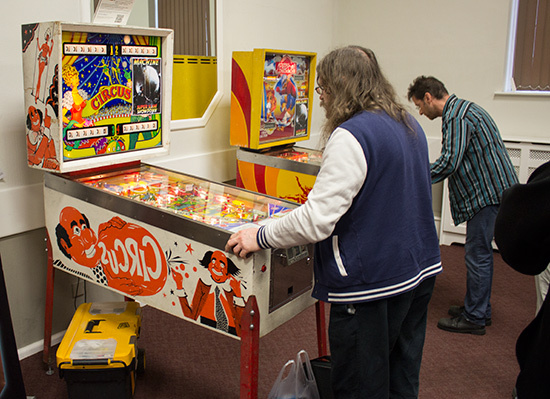 In total there were 86 pinballs (2012:100) and 60 video games (2012: 36). 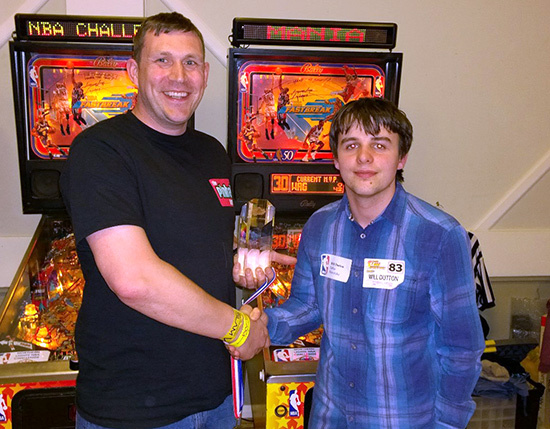 In addition to these, eight pinballs were used in the Super Slam Showdown tournament, another eight in the Not The Welsh Classic, But The Dave Rolfe Memorial Classic That's So Classic It's Classic, Classic tournament, three more for high score competitions (X-Men Wolverine, AC/DC BIBLE and Monster Bash), another two NBA Fastbreaks in the Pinball Mania NBA Challenge, and an Austin Powers in the Psych Out competition. 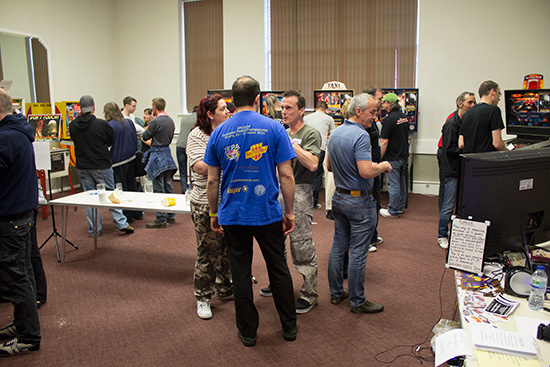 Apart from the machines, there were a number of vendors set up at the Slam. 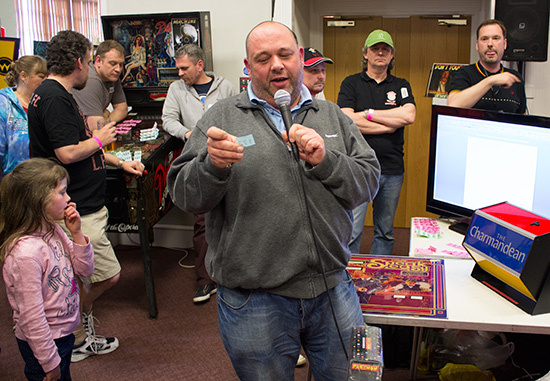 Sean from Pinball Palace brought ColorDMDs, Mill Wax cleaning products, replacement PCBs and displays, and copies of Pinball Wizard magazine. 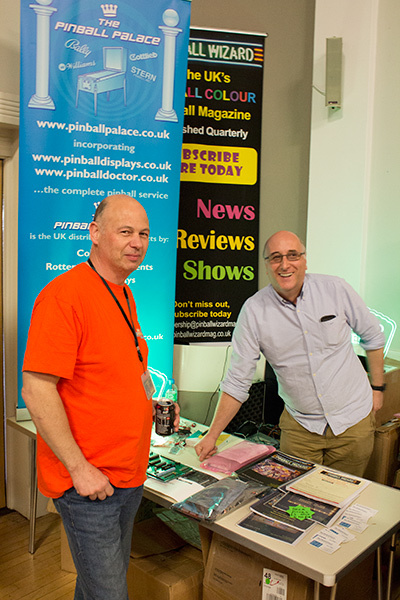 Next to Sean was Jonathan Joosten's stand, from which he was selling copies of his new book, Pinball, and the first two issues of Pinball Magazine. Having carefully scrutinised the quality of the printing, construction and packaging, Jonathan declared he was very happy with the way the book had turned out. 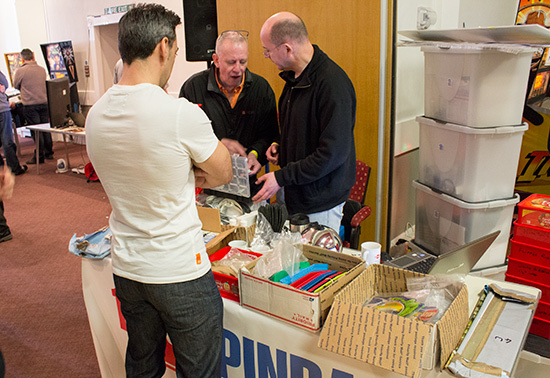 Just along from Jonathan, Jon Melleny of 1 Stop Pinball had a stand with numerous boxes of assorted pinball parts. Sharing space in the bar area with the video games were two more vendors. 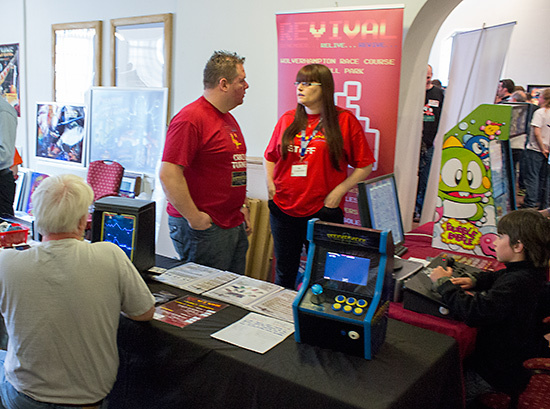 The team behind the Revival retro gaming show taking place in August at Wolverhampton Racecourse brought some miniature video games to the Slam to promote their event. 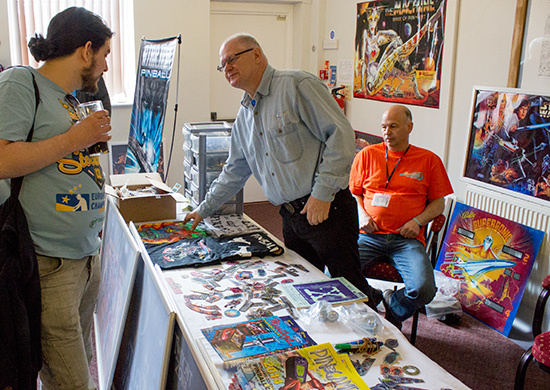 Next to them was Gary Flower selling assorted pinball paraphernalia and memorabilia. 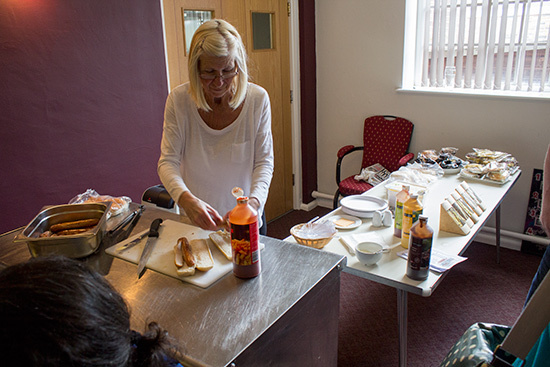 The bar was kept busy all day, but for those in need of more than liquid refreshment, there was also a stand next to the bar selling hot dogs, burgers, sandwiches, chips, potato crisps and assorted confectionary. If those options didn't suit you, a number of shops, take-away food outlets and a pub were just a few minutes away from the venue by foot. 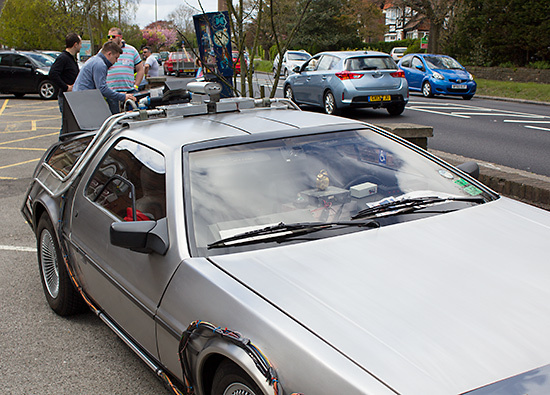 Those who ventured outside on Saturday discovered a whole new movie theme had taken over the front car park. 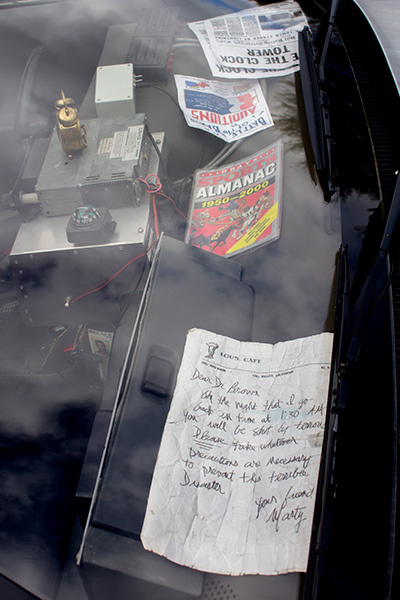 A Back to the Future pinball was being played to advertise the Slam to the slowly-passing traffic, while the fully tricked-out De Lorean had everything to make it look like it just came out of the movie. 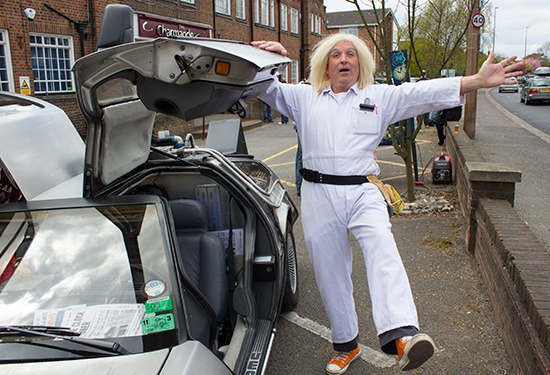 What use is the De Lorean without Doc Brown? 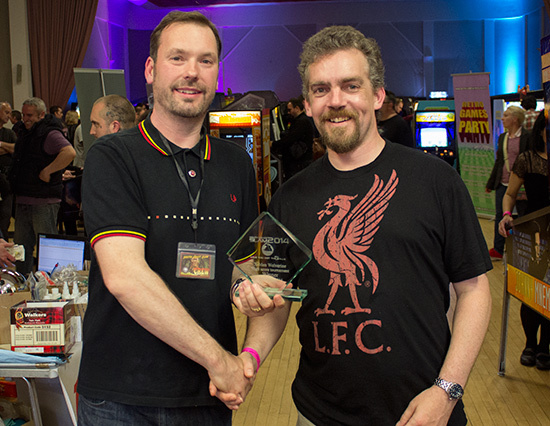 Naturally, the South Coast Slam featured a number of competitive events. 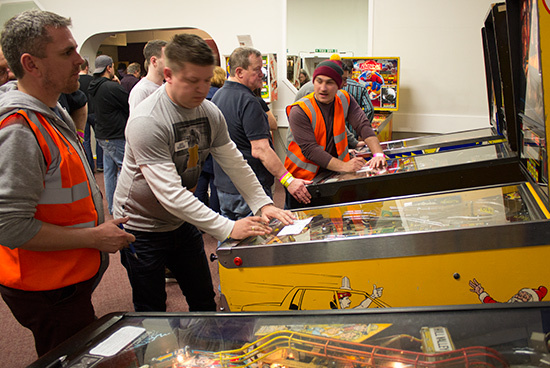 The main one was the Super Slam Showdown which attracted 105 competitors who played a single game on five out of the eight available machines. 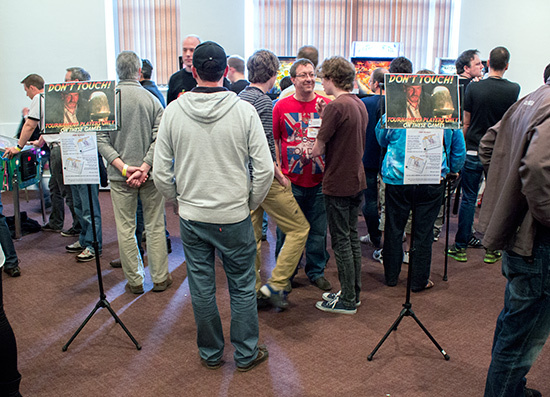 Scores were recorded on player cards, and everyone had the opportunity to play a Do-or-Die game which replaced one of their previous scores. Current rankings were shown on a 40-inch LCD monitor. 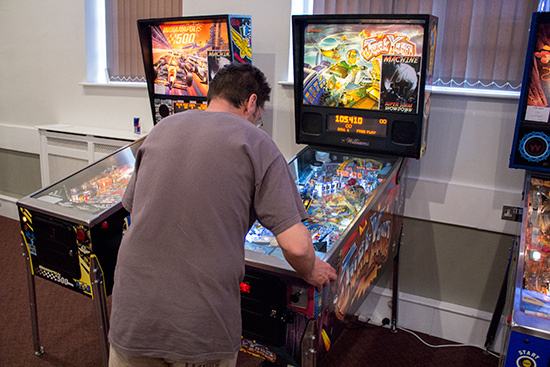 The popularity of the tournament led to daunting-looking queues for some of the machines, but they were generally quite fast moving and nearly everyone got to play all their games during the qualifying period which ran until 4pm. 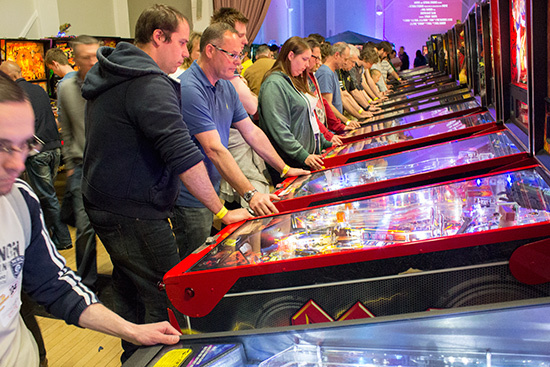 Once all the scores had been entered, the three highest scorers on each machine progressed to the play-offs. Where some players qualified more than once, fourth placed players were added until a total of 24 qualifiers were found. 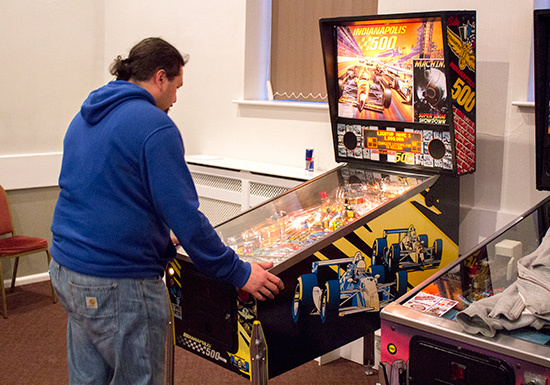 This resulted in the top four players on all eight machines actually making it through. 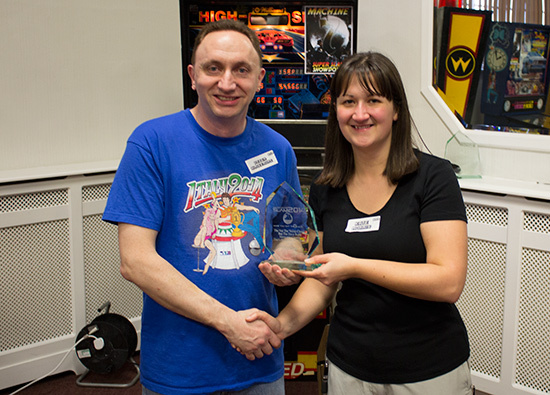 They were then paired up by way of a draw to play best-of-three matches on machines of their choice. 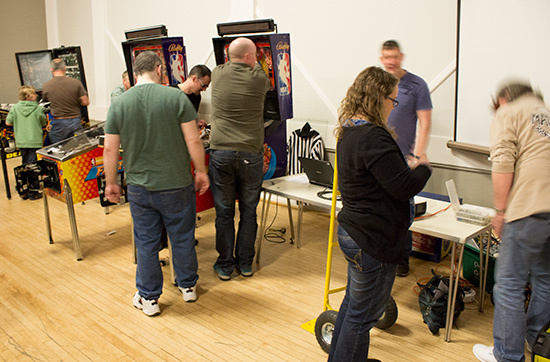 Each player chose one machine with a randomly selected machine chosen for them if it was a tie after two games. Another round of best-of-three matches saw the number remaining fall to six, with just one more win needed to reach the final. 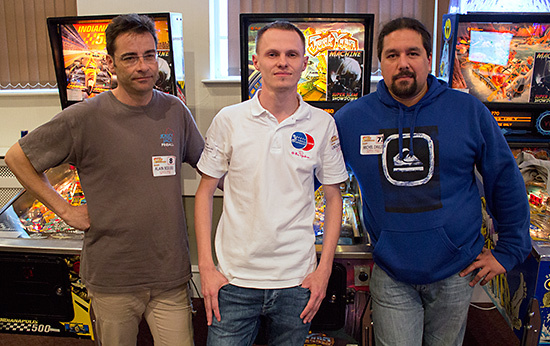 The penultimate round saw wins for Alain, Lukasz and Michel, so they went into the three-game final, while David, Greg and Richard played a single game to decide 4th-6th places. 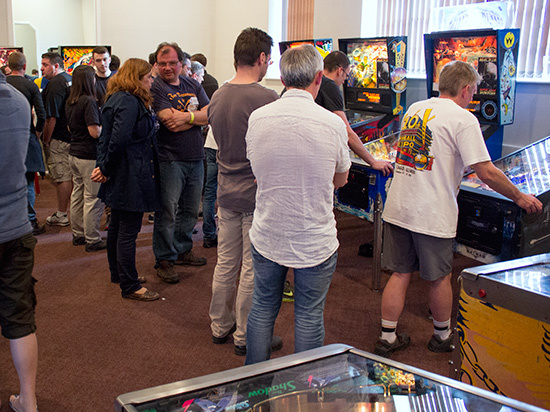 In the final, each player could choose a machine on which to play a three-player game but the choice of play positions was up to the other players. The winner of the game scored 5 points, second place scored 2 points, and the third-placed player scored no points. Whoever had the most points after the three games would be the winner. 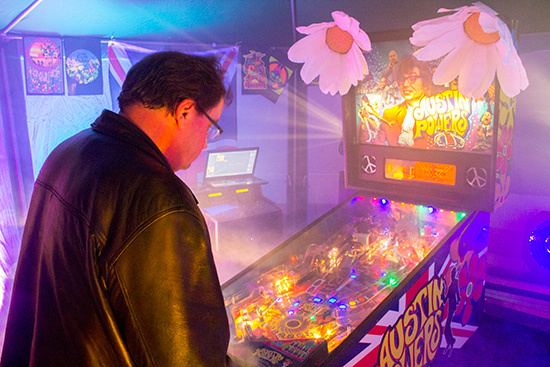 The first game was played on Alain's choice of Junkyard. It proved to be a good choice for Alain, as he took the win with 16.7M to Lukasz's 10.6M and Michel's 4.4M. So after one game, Alain had 5 points, Lukasz 2 points and Michel 0 points. Next came Lukasz's choice of AC/DC. After two balls it was relatively close, with Lukasz leading with 17.8M to Alain's 11.8M and Michel's 8.1M. But the third ball changed all that. Lukasz had a blistering last ball and pushed his score up to an unassailable 112.7M. Alain got closest with his 24.2M, with Michel again in third on 9.9M. So Alain and Lukasz both had 7 points from one win and one second place. Michel couldn't end up anything but third, but whoever finished highest in the third game between Lukasz and Alain would win. That third machine was chosen by Michel and was Indianapolis 500. 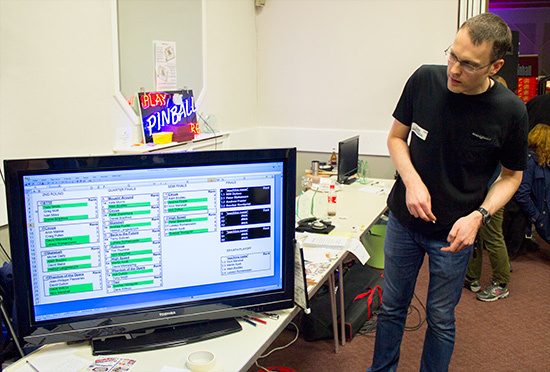 As with the first two games, Michel chose his game wisely, putting up a third ball score of 529.5M. 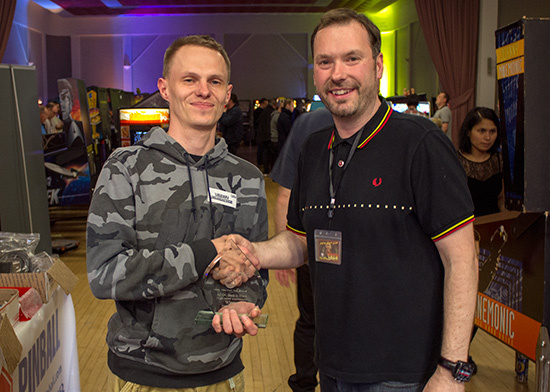 Lukasz was player two and came close to Michel on 444.9M. Alain only had 29M after his first two balls following a couple of unlucky early drains. Could he claw his way back and overtake Lukasz's score to win the final? Unfortunately his bad luck so far on Indianapolis 500 stayed with him, and he drained his third ball with a little over 30M on the scoreboard, giving the win to Lukasz who ended on 9 points. Alain was second on 7 points and Michel third on 5 points. 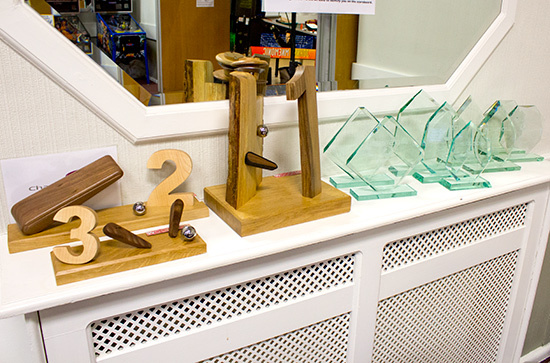 Tournament organiser Martin Ayub presented the specially-made trophies designed and built by Woodtech. In addition, Lukasz won a pair of high quality Bowers & Wilkins headphones. 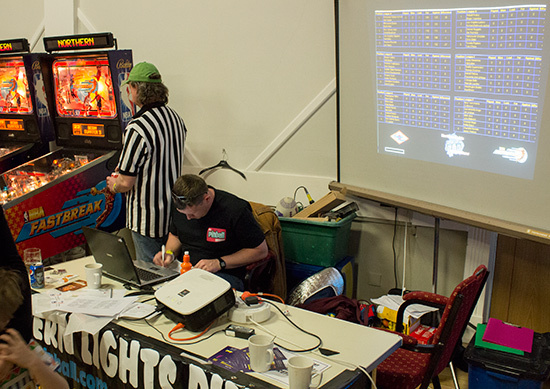 Saturday was also the day of the Pinball Mania NBA Fastbreak Challenge run by the Northern Lights Pinball team. They brought three NBA Fastbreak games along, two of which were linked and used for the competition. Thirty players competed in six groups of five, each representing one of the teams in the NBA. Everyone played a head-to-head game against the other four players in their group. When all the matches were over, the eight players with the most wins and the greatest points victories qualified for the knock-out rounds. Lukasz, Sverker, Will and Jim made it through to the semi-finals, and from those it was Lukasz and Will who made it into the final. 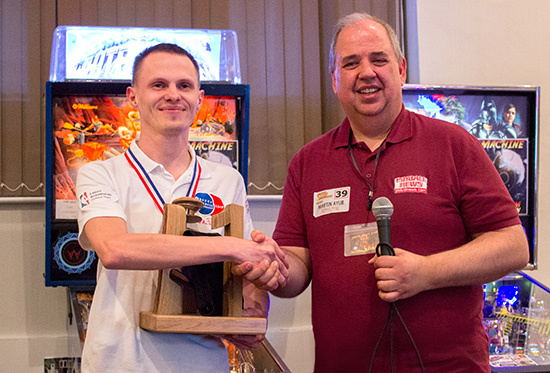 In that final, it was a clear win for Will Dutton who beat Lukasz by 61 points to 30. 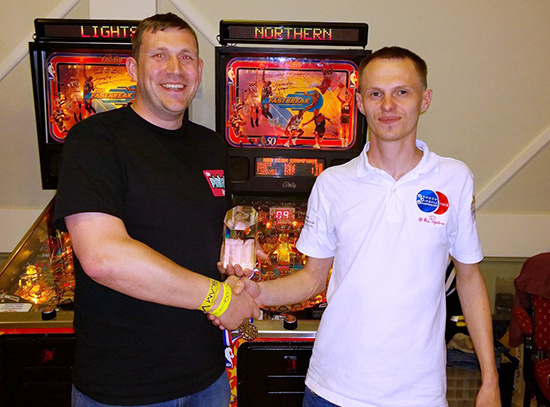 In the play-off, Sverker took third place with a win over Jim Lindsay by 46 points to 28. 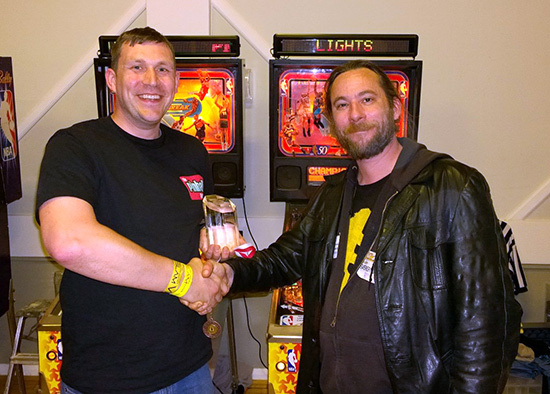 The top three players received their trophies from Northern Lights Pinball's Dan Hardy. 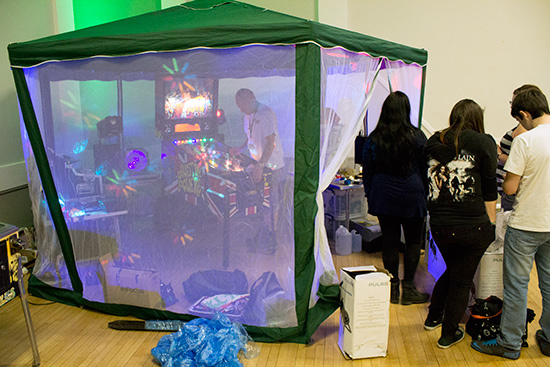 While all this was taking place, an even less conventional competition was running in the Psych Out tent thanks to organiser Ivan Durneen. 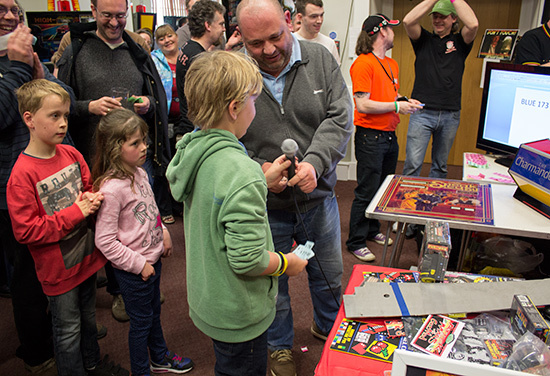 Competitors had to don kaleidoscopic glasses, pay their £1 entry fee, and play a game on Austin Powers. As if that wasn't bad enough, they were bombarded with flashing lights, lasers and loud music, while smoke assailed the nostrils to overload even more of their senses. 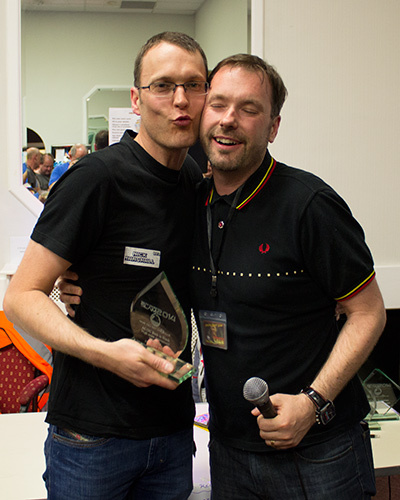 The competition ran through to Sunday afternoon, when whoever had the highest score would win the Psych Out trophy. 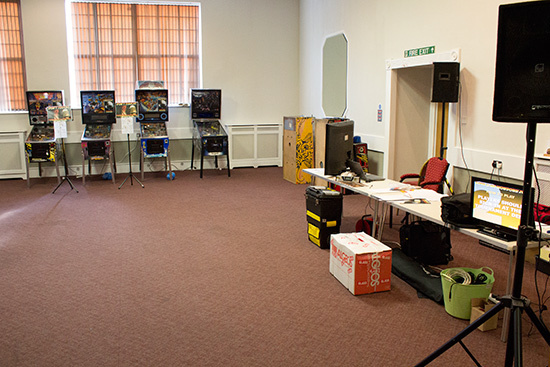 All this took place on Saturday, and you too can take a look around the South Coast Slam 2014 on Saturday afternoon with our exclusive Eight Minute Tour video. 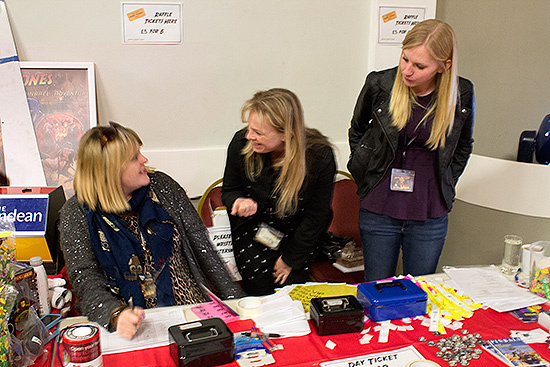 Although the South Coast Slam officially closed at 6pm each day, on Saturday evening there was a special VIP evening session for those purchasing a £10 pass. This allowed unlimited play from 7pm until midnight without all the crowds and with the addition of masses of Dominos pizzas delivered around 8pm. 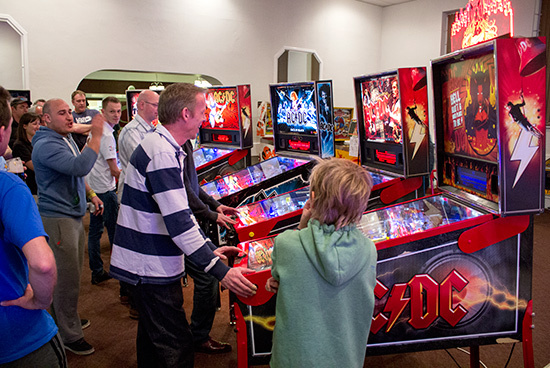 There was also a fun AC/DC competition run by Craig Pullen using the five AC/DC machines present at the Slam. 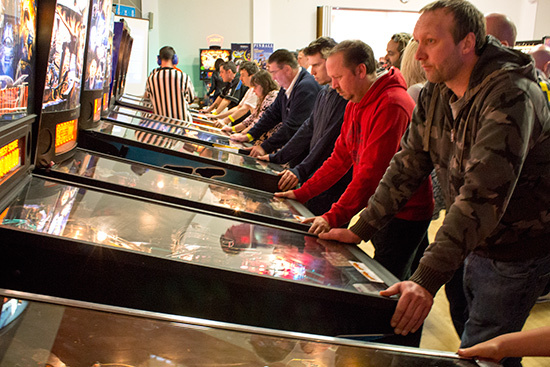 The machines were set to one ball per game and five players started playing simultaneously, all choosing the same song. Whoever kept playing for the longest won the round, so no cradling or trapping of the ball was allowed. 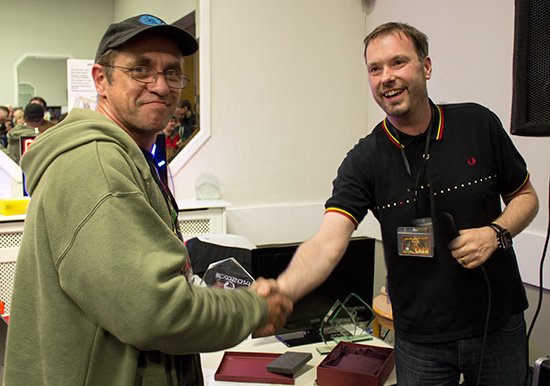 After the qualifying rounds, a semi-final and a final, the winner was Mark Potter who took home a little something for his troubles. 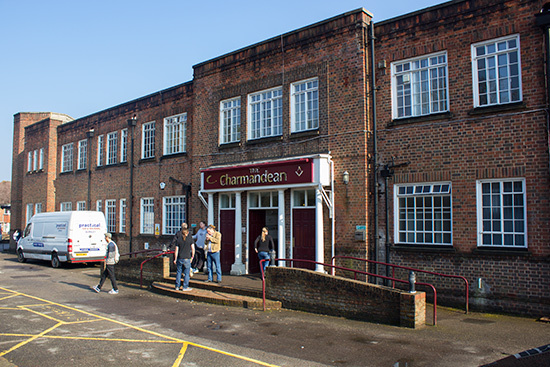 Having closed at midnight, the show re-opened at 11am on Sunday, which was also the start time for the day's main tournament. 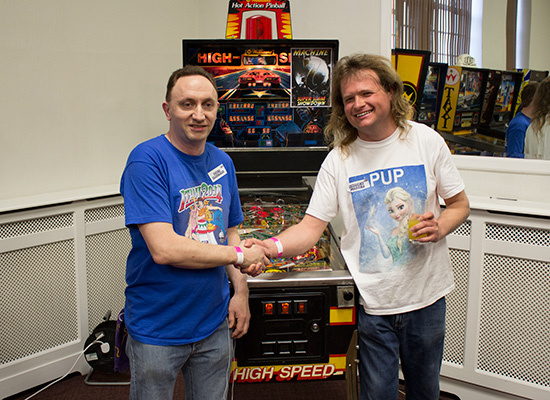 The Not The Welsh Classic, But The Dave Rolfe Memorial Classic That's So Classic It's Classic, Classic was run by Nick Marshall and Kate Morris and took a similar format to the previous day's Super Slam Showdown, with eight machines and the top three scorers on each going through to the play-offs. 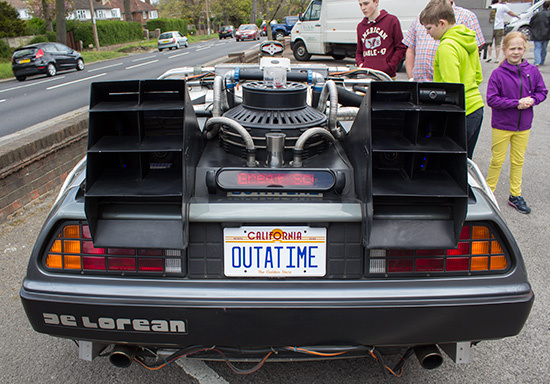 The titles used were Circus, Skateball, Mousin' Around, Robocop, Taxi, Back to the Future, High Speed and Phantom of the Opera. 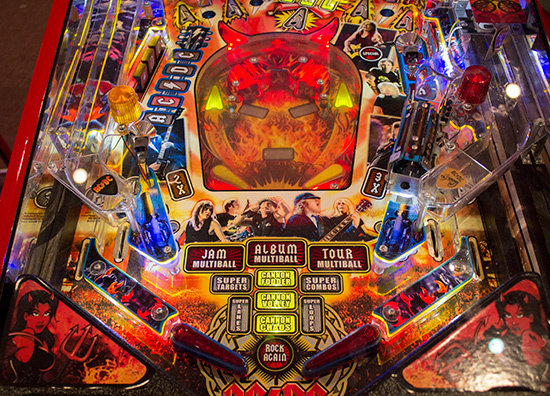 Players could play four games of their choice from the eight machines with a single entry. Up to two entries could be purchased at £5 ($8.40, €6) each, and no individual machine could be played more than twice in total. The top scorers on each machine earned a bye through the first round of play-offs. They were: Andrew Foster, Kate Morris, Martin Ayub, Peter Blakemore, Sverker Nordqvist, Terry Sullivan, Tim Thornton and Will Dutton. 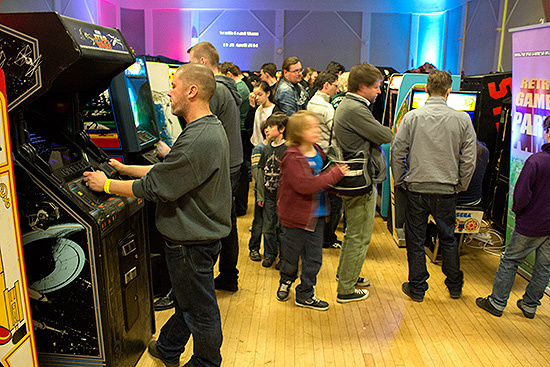 The remaining 16 played a single game in four groups of four on randomly selected machines. The top two scorers from each group - eight in total - went into the quarter finals to meet the eight top qualifying round scorers. The eight winners from those matches went into the semi-finals, from which the four finalists were decided. 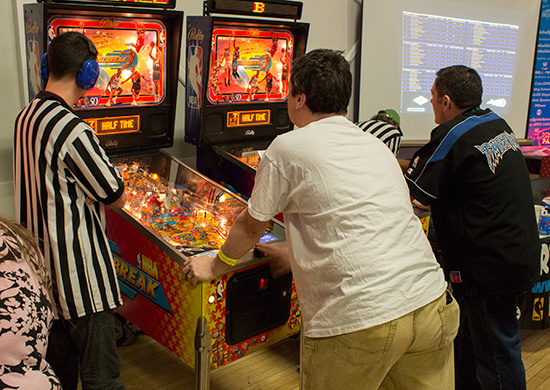 The final consisted of three games on pre-selected machines. After each game the lowest scoring player dropped out. 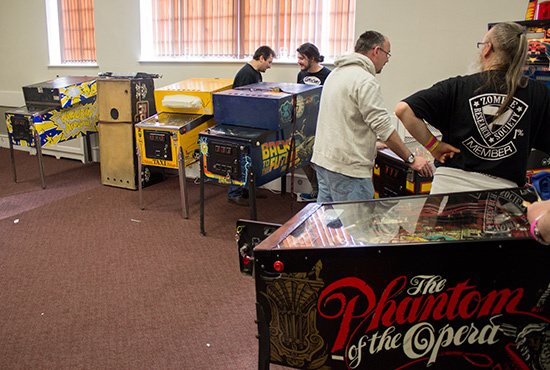 The first game was played on Phantom of the Opera. 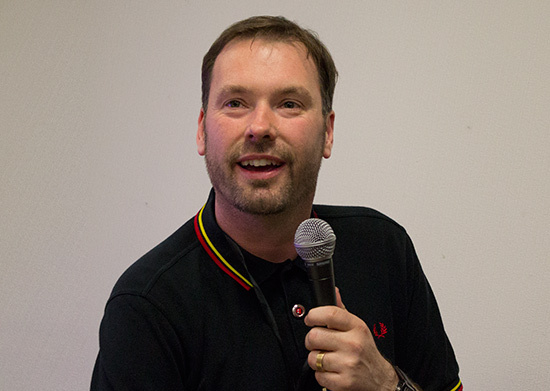 Will Dutton was the lowest scorer and so ended up in fourth place. 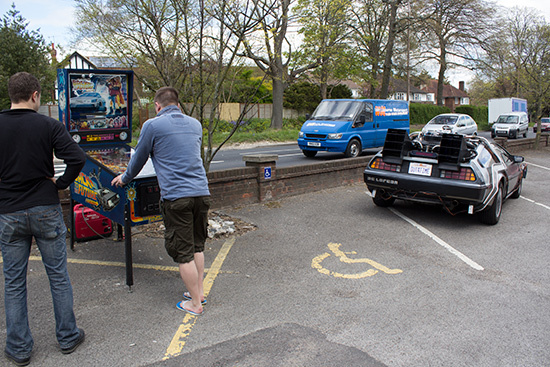 Play then moved on to Taxi. Sverker Nordqvist was eliminated in this round and ended third. The final match was then held on High Speed between Peter Blakemore and Andrew Foster. 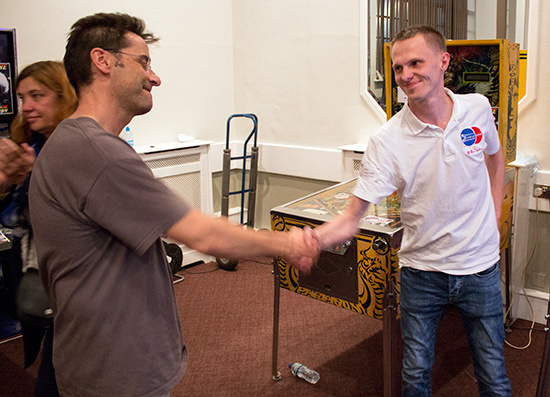 There were no big scores set in the final, and after their second balls there was little to separate the two finalists, with Andrew on 252K to Peter's 304K. Andrew recovered a little on his third ball to end his game on 386K, leaving Peter needing just 83K to win. 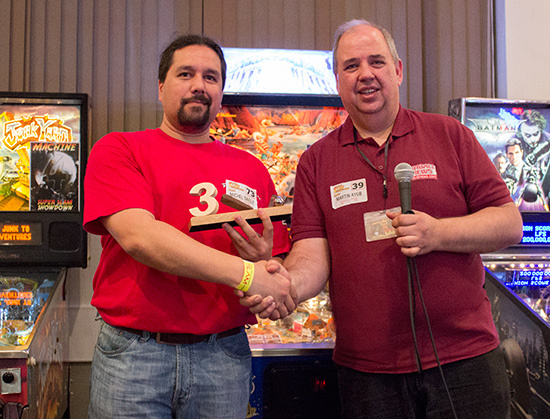 But it was not to be, as a quick drain on Peter's third ball saw him finish on 319K, making Andrew the winner. 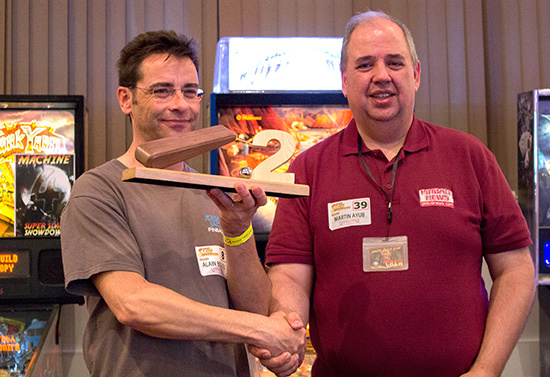 In the play-off for 5th-8th place on Mousin' Around, Lukasz Romanowski won to end up 5th, Alain Boulieu ended 6th, Martin Ayub was in 7th place and Nick Marshall 8th. 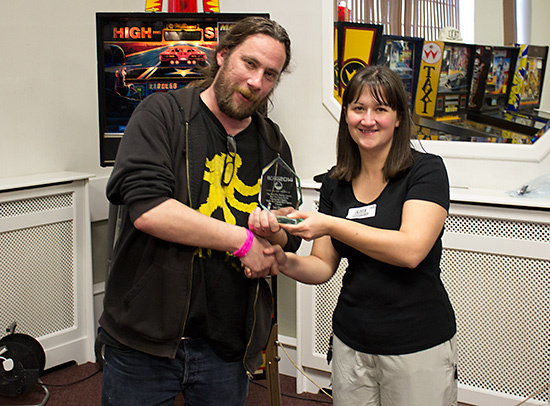 The trophies were then awarded by organiser Kate Morris. 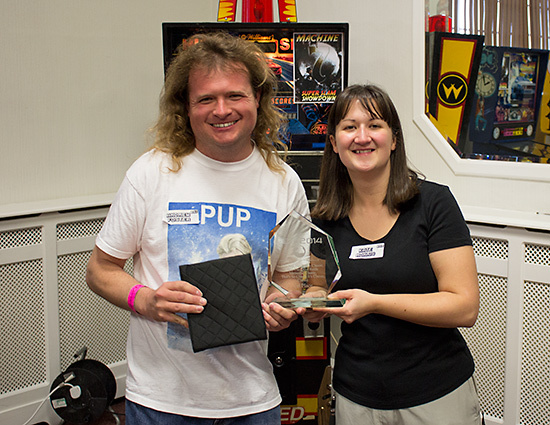 Once the tournament presentations were over, it was time for the awards to the winners of the high score competitions being run on AC/DC and X-Men, and the Psych Out competition. 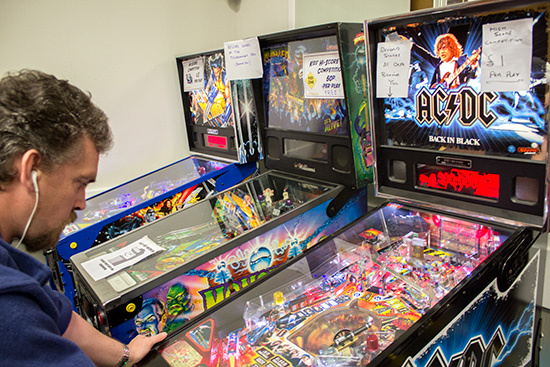 The high score competitions were run on AC/DC Back in Black and X-Men Wolverine which were set up in the tournament area. 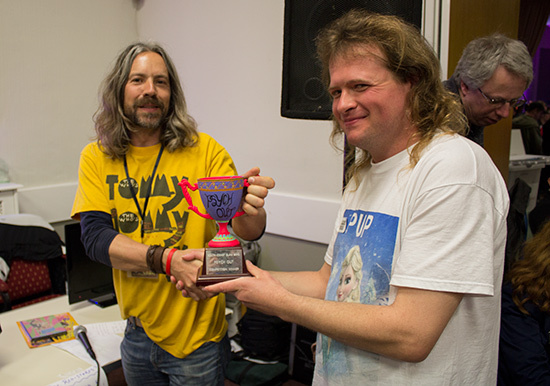 The trophies were presented by Slam organisers Will Barber and Ivan Durneen. 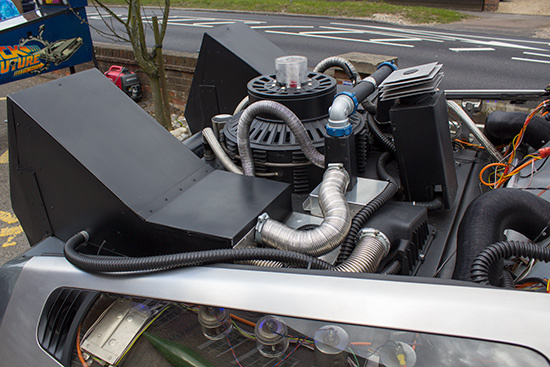 Next there was an award for best machine of the show which went to Stan Simpson for his heavily modded AC/DC Premium. 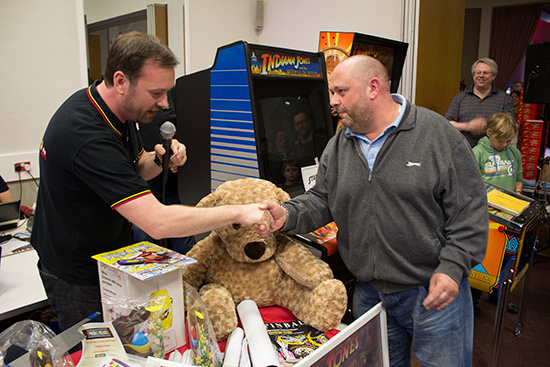 Then came the charity raffle draw. 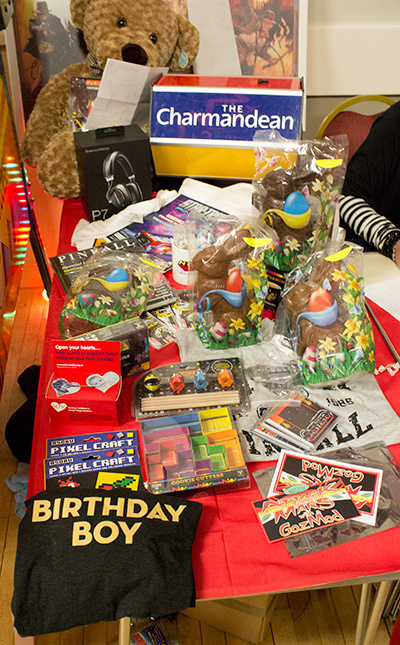 The number of prizes had increased as the show progressed and eventually extended across two tables. 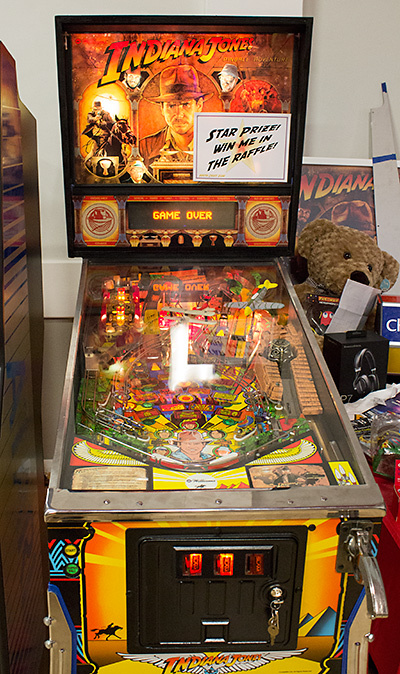 The first draw was for the Indiana Jones pinball, and the ticket was selected by 23-month-old Louis Eaton. 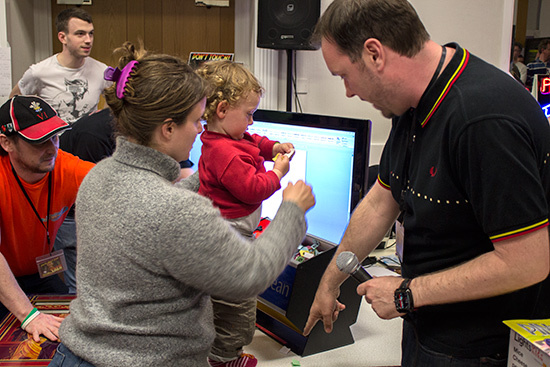 The raffle continued for another half hour until all the prizes had been claimed. Anyone not present at the draw had a prize picked for them. The Slam then remained open for another hour until the hall officially closed to the public at 6pm. 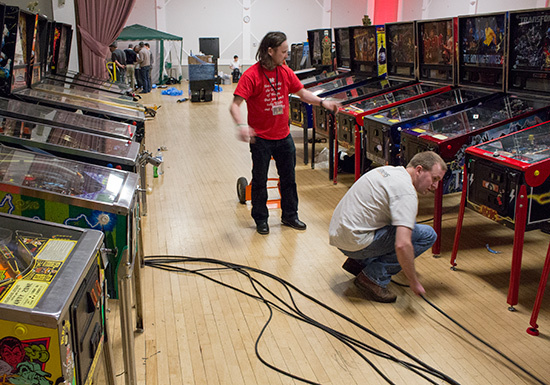 Unlike some shows, the machines remained set up in the hall and playable by the public until closing time. Then it was time to start packing them away and transporting them out of the hall into the waiting vehicles lined up around the building. For the organisers this process continued through Monday, while the last of the videos didn't leave until Tuesday. If there was ever any doubt about the popularity of the South Coast Slam, the number of visitors and competitors blew those away, while the two year wait only served to make regulars anticipate the weekend even more. 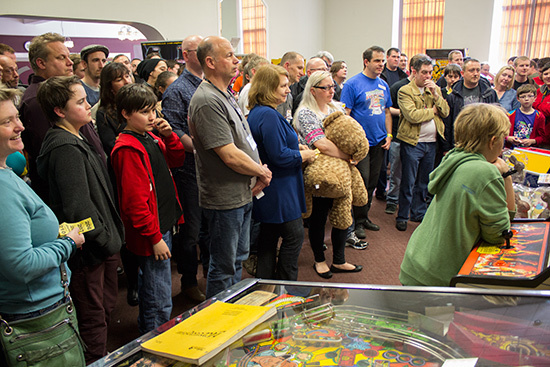 Although there was no one special guest flown in from the US, there were plenty of well-known pinball faces at the show, and the money saved will help bolster the sum donated to charity once all the calculations have been made. Holding the Slam on Easter weekend necessarily increased costs for everyone, but also put everyone in a holiday mood and gave many participants an extra day to prepare (and another to recover). 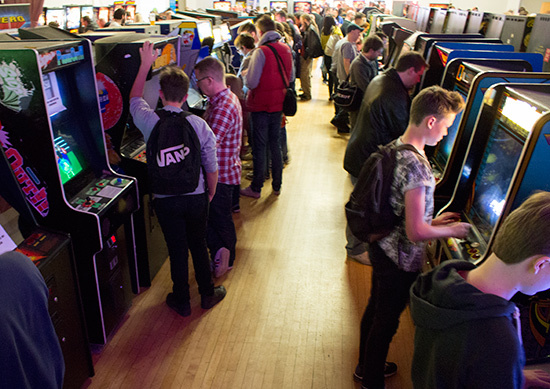 Even then, with all the tournaments, competitions and machines to enjoy, there's never enough time to socialise and catch up with everyone you want to see. There's only one solution - let's do it all over again next year.